Shirts With Random Triangles: Oklahoma, TCU, and four other Big 12 teams seem headed for bowl eligibility. Oklahoma need to go at least 2-2 to become bowl eligible this season. The negative part in this is that two losses would probably knock the Sooners out of College Football Playoff contention. The Sooners host 2-2 (0-1conference) Iowa State this Saturday (Oct. 7). Logic would suggest that this should be an easy win for the Sooners. On the other hand, logic and the Big 12 have never been on good terms, so any outcome is possible here. Beyond Iowa St., the Sooners face the annual Red River Shootout with hated rival Texas on Oct. 14, which means the college football chaos engines probably will be overheating that weekend. Oklahoma travels to Kansas State on Oct. 21, then concludes the month by hosting Texas Tech on Oct. 28. If Alabama, Clemson, and Oklahoma all win out the rest of the season, the current rankings should remain to where the Crimson Tide and Tigers hold on to the top two spots. The only other unbeaten team in the Big 12 begin the month hosting 3-1 West Virginia on Oct. 7. The Horned Frogs travel to Kansas State on Oct. 14, then host Kansas on Oct. 21, and finish out October on the road against Iowa State on Oct. 21. Kansas and Iowa State are the real trap games here for TCU to look out for. Washington head coach Chris Petersen led Bosie State to a win over TCU in the 2010 Fiesta Bowl. The Cowboys CFP hopes seem to have been busted thanks to TCU. Oklahoma St. comes off a Week 6 bye to host Baylor on Oct. 14. The Cowboys travel to Texas on Oct. 21, then continue on the road to face West Virginia Oct. 28. The Bedlam game against in-state rival Oklahoma comes up on Nov. 4. 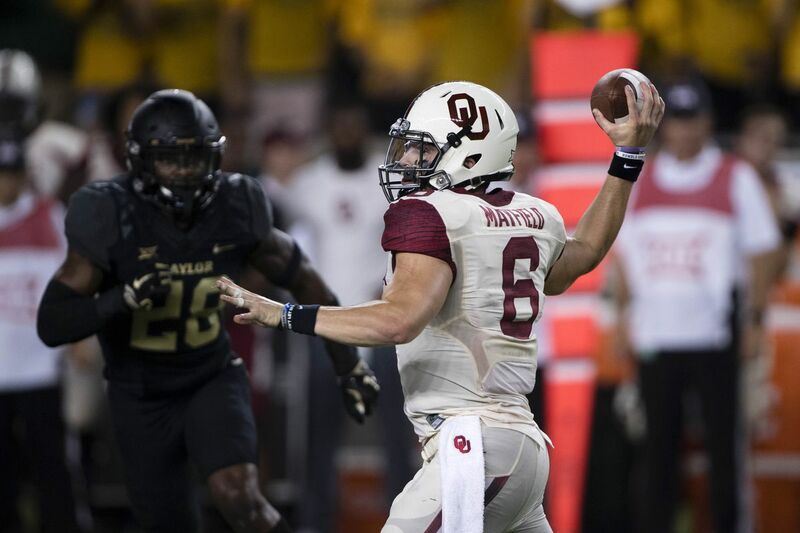 Baylor and the lackluster Texas looks like the best bets for the two wins Oklahoma State needs for bowl eligibility. Any chance to see "The Mullet" Mike Gundy take on "The Pirate" Mike Leach in a coaching duel is must-watch television no matter what the bowl. Kansas State faces a near impossible task in getting the three wins needed for bowl eligibility in October. The Wildcats travel to Texas on Oct. 7, then host the conferences two undefeated teams back to back. TCU comes to Manhattan on Oct. 14, followed right behind by Oklahoma on Oct. 21. The only possible "gimme" in October turns out to be in-state rival Kansas on Oct. 28. Facing Virginia Tech in the second of the three Orlando-based bowls is one to put on the watch list. The Red Raiders are coming off a loss to Oklahoma State in Week 5. Week 6 gets somewhat easier as it travels 1-3 Kansas on Oct. 7. The road trip continues for Texas Tech as it faces West Virginia on Oct. 14. The Raiders' only home game in October comes on Oct. 21, when they host West Virginia. A road trip to Oklahoma St. on Oct. 28 ends what could be a very rough month for Texas Tech. If Les Miles were still LSU head coach, the Liberty Bowl would be on the watch list this season. However, the Tigers are being coached by the ever diminishing returns known as Ed Orgeron, which means this matchup might not even happen.